Batman #1 (spring 1940). Art by Bob Kane and Jerry Robinson. Detective Comics #27 – 881 May 1939 October 2011 Detective Comics has had a varied rate of publication from quarterly to monthly and has varied between an anthology series and single stories. 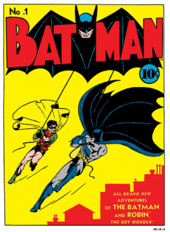 The first 26 issues did not feature Batman; however, issue #26 mentions Batman for the first time in an advertisement for his introduction in the following issue. The run included a #0 issue dated October 1994 and a #1,000,000 issue dated November 1998. Batman #1 – 713 Spring 1940 The run included a #0 issue dated October 1994 and a #1,000,000 issue dated November 1998. World's Finest Comics #1 – 323 Spring 1941 January 1986 The first issue was published under the indicia World's Best Comics. The main premise of the series was to be a Batman/Superman team-up series. During its run, the title varied from quarterly to monthly publication. Star-Spangled Comics #65 – 130 February 1947 July 1952 A strip featuring Robin was added to the anthology series with issue #65 and ran all the way to issue #130, the last issue of the series. The Brave and the Bold #67 – 200 August - September 1966 July 1983 Originally formatted as an anthology/try-out series, The Brave and the Bold became a team-up series with issue #50. With issue #67, Batman became the primary character used in the series. During its run, the series varied between bi-monthly and monthly publication. The Joker #1 – 9 May – June 1975 September – October 1976 Published bi-monthly. The Joker #10 was announced but never published. Batman Family #1 – 20 September – October 1975 October – November 1978 Anthology series published bi-monthly. It was merged with Detective Comics in issues #481-495 of that series. Man-Bat #1 – 2 December 1975 – January 1976 February – March 1976 Published bi-monthly. Batman and the Outsiders #1 – 32 August 1983 April 1986 The series continued, but was retitled The Adventures of the Outsiders with issue #33. The Adventures of the Outsiders #33 – 46 May 1986 June 1987 The series picked up from Batman and the Outsiders #32. It began reprinting The Outsiders with issue #39. Legends of the Dark Knight #1 – 36 November 1989 Late August 1992 The series continued, but was retitled Batman: Legends of the Dark Knight with issue #37. Publication varied between monthly and bi-weekly. Batman: Shadow of the Bat #1 – 94 June 1992 February 2000 The run included a #0 issue dated October 1994 and a #1,000,000 issue dated November 1998. Batman: Legends of the Dark Knight #37 – 214 September 1992 March 2007 The series picked up from Legends of the Dark Knight #36. The run included a #0 issue dated October 1994. The Batman Adventures #1 – 36 October 1992 October 1995 Based on the animated television series Batman: The Animated Series. Catwoman volume 2 #1 – 94 August 1993 July 2001 The run included a #0 issue dated October 1994. Outsiders volume 2 #1 – 24 November 1993 November 1995 The run totaled 26 issues, with issue #1 being printed as two issues numbered "#1α" and "#1Ω" cover-dated November 1993, and included a #0 issue dated October 1994. Robin volume 4 #1 – 183 November 1993 April 2009 The run included a #0 issue dated October 1994 and a #1,000,000 issue dated November 1998. Azrael #1 – 46 February 1995 May 2003 The run included a #1,000,000 issue dated November 1998. The series was renamed and continued as Azrael: Agent of the Bat with issue #47. The Batman Chronicles #1 – 23 July 1995 Winter 2001 Published quarterly. The Batman and Robin Adventures #1 – 25 October 1995 December 1997 Based on the animated television series The Adventures of Batman & Robin. Nightwing volume 2 #1 – 153 October 1996 April 2009 The run included an #1/2 issue and an #1,000,000 issue dated November 1998. Batman: Gotham Adventures #1 – 60 June 1998 May 2003 Based on the animated television series Batman: The Animated Series. Batman 80-Page Giant #1 – 3 August 1998 July 2000 Published annually. Azrael: Agent of the Bat #47 – 100 December 1998 May 2003 The series picked up from Azrael #46. Batman Beyond volume 2 #1 – 24 November 1999 October 2001 Based on the animated television series Batman Beyond. Published under the Blackest Night trade dress. The Batman Adventures volume 2 #1 – 17 June 2003 October 2004 Based on the animated television series Batman: The Animated Series. The Batman Strikes! #1 – 50 November 2004 December 2008 Based on the animated television series The Batman. February 2009 The series continued, but was retitled The Outsiders volume 4 with issue #15. The last issue of the series has been solicited as changing back to this title. Batman: The Brave and the Bold #1 – 22 March 2009 December 2010 Based on the animated television series Batman: The Brave and the Bold. The Outsiders volume 4 #15 – 39 April 2009 June 2011 The series picked up from Batman and the Outsiders volume 2 #14. The title was changed back with issue #40. Batwoman #0 – 40 May 2015 The issue #0 from January 2011 is called "Beyond a Shadow" and makes up Batwoman volume 1 all by itself. In September 2011, Batwoman volume 2 started under the New 52 moniker. In September 2012 Batwoman volume 2 #0 came out as part of the Zero Month event. Volume 2 also contains Annuals #1-2 and a Futures End #1. It concluded with issue #40. The All New Batman: The Brave and the Bold #1 – 16 April 2012 Based on the animated television series Batman: The Brave and the Bold. Batman: Arkham Unhinged #1 – 20 April 2012 January 2014 Print edition of the weekly web comic of the same title, which began in October 2011. Based on the Batman: Arkham City video game. Batman Incorporated volume 2 #1 – 13 May 2012 July 2013 The run includes a #0 issue dated September 2012 and a Special #1 dated August 2013. Worlds' Finest #1 – 32 July 2012 May 2015 The run includes a #0 issue dated November 2012 and a Futures End #1 dated November 2014. Legends of the Dark Knight volume 2 #1 – 13 December 2012 December 2013 Print edition of the weekly web comic of the same title, which began in June 2012. Batman '66 #1 – 30 July 2013 December 2015 Print edition of the weekly web comic of the same title, which began in July 2013. Based on the 1960s TV series. Detective Comics volume 3 #934 – present Resumed classic numbering. With 881 issues of Pre-Flashpoint and 52 issues of The New 52, it brings the total to 933. So, with DC Rebirth, the first new Detective Comics issue is #934. From mid-1961 to mid-1964 Batman Annual was published semi-annually. The title was brought back in 1982 continuing the first volume numbering and returned to annual publication from 1985 to 2000. It was brought back again in 2006 and shifted to bi-annual publication starting in 2007. Detective Comics Annual #1 – 12 1988 February 2011 From 1988 to 1997 Detective Comics Annual was published regularly. Sporadic issues have been published in 2009 and 2011. Legends of the Dark Knight Annual #1 – 2 1991 1992 The series continued but was retitled Batman: Legends of the Dark Knight Annual with issue #3. Robin Annual #1 – 7 1992 December 2007 There is a 10-year gap between issues #6 and #7. Batman: Legends of the Dark Knight Annual #3 – 7 1993 1997 The series picked up from Legends of the Dark Knight Annual #2. The Batman Adventures Annual #1 – 2 1994 1995 Based on the animated television series Batman: The Animated Series. The Batman and Robin Adventures Annual #1 – 2 1996 1997 Based on the animated television series The Adventures of Batman & Robin. Shadow of the Batman #1 – 5 December 1985 April 1986 Reprints Detective Comics #469-476 and #478-479. Robin II: The Joker's Wild! December 1991 Published bi-weekly. Robin III: Cry of the Huntress #1 – 6 December 1992 March 1993 Published bi-weekly. Batman: Manbat #1 – 3 October 1995 December 1995 Published under the "Elseworlds" logo. Batman: The Ultimate Evil #1 – 2 December 1995 December 1995 Published bi-weekly. The comic book adaptation of the 1995 novel of the same name by Andrew Vachss. Batgirl and Robin: Thrillkiller #1 – 3 January 1997 March 1997 Published under the "Elseworlds" logo. Elseworld's Finest #1 – 2 1997 1997 Published under the "Elseworlds" logo. Batman Adventures: The Lost Years #1 – 5 January 1998 May 1998 Based on the animated television series Batman: The Animated Series. Batman: Dark Knight of the Round Table #1 – 2 December 1998 January 1999 Published under the "Elseworlds" logo. Superman & Batman: Generations #1 – 4 1999 1999 Published under the "Elseworlds" logo. Batman Beyond volume 1 #1 – 6 March 1999 August 1999 Based on the animated television series Batman Beyond. Batman: Book of the Dead #1 – 2 June 1999 July 1999 Published under the "Elseworlds" logo. Batman: The Doom That Came To Gotham #1 – 3 November 2000 January 2001 Published under the "Elseworlds" logo. Batman: Turning Points #1 – 5 January 2001 January 2001 Published weekly. Batman: Hollywood Knight #1 – 3 April 2001 June 2001 Published under the "Elseworlds" logo. Batman: League of Batmen #1 – 2 2001 2001 Published under the "Elseworlds" logo. Superman & Batman: Generations II #1 – 4 August 2001 November 2001 Published under the "Elseworlds" logo. Joker: Last Laugh #1 – 6 December 2001 January 2002 Published weekly as the spine of a company-wide crossover event. Batman: Family #1 – 8 December 2002 February 2003 Published weekly. Superman & Batman: Generations III #1 – 12 March 2003 February 2004 Published under the "Elseworlds" logo. Batman: Nevermore #1 – 5 June 2003 October 2003 Published under the "Elseworlds" logo. Batman: Dark Detective #1 – 6 July 2005 September 2005 Published bi-weekly. All Star Batman & Robin, The Boy Wonder #1 – 10 September 2005 August 2008 Originally intended to be a 12-issue monthly series. The last two issues remain unpublished to this day. Huntress: Year One #1 – 6 Early July 2008 Late September 2008 Published bi-weekly. Superman & Batman vs. Vampires & Werewolves #1 – 6 Early December 2008 Late February 2009 Published bi-weekly. Azrael: Death's Dark Knight #1 – 3 May 2009 July 2009 Published under the "Battle for the Cowl" trade dress. Oracle: The Cure #1 – 3 May 2009 July 2009 Published under the "Battle for the Cowl" trade dress. Batman: Unseen #1 – 5 Early December 2009 February 2010 Published bi-weekly. Batman: Orphans #1 – 2 Early February 2011 Late February 2011 Published bi-weekly. Batman: Arkham City #1 – 5 Early July 2011 October 2011 Published bi-weekly. Based on the Batman: Arkham City video game. Batman: The Official Comic Adaptation of the Warner Bros. Motion Picture 1989 Published in conjunction with the film Batman. Batman: The Blue, the Grey, and the Bat Published under the "Elseworlds" logo. Batman Returns: The Official Comic Adaptation of the Warner Bros. Motion Picture Published in conjunction with the film Batman Returns. Batman: Mask of the Phantasm 1993 Published in conjunction with the animated film Batman: Mask of the Phantasm. Batman: Bloodstorm 1994 Published under the "Elseworlds" logo. Batman: Castle of the Bat Published under the "Elseworlds" logo. Batman: In Darkest Knight Published under the "Elseworlds" logo. The Batman Adventures Holiday Special #1 February 1994 Based on the animated television series Batman: The Animated Series. Batman Forever: The Official Comic Adaptation of the Warner Bros. Motion Picture July 1995 Published in conjunction with the film Batman Forever. Underworld Unleashed: Batman - Devil's Asylum #1 1995 Published as part of the Underworld Unleashed crossover event. Batman: Brotherhood of the Bat Published under the "Elseworlds" logo. Batman: Dark Allegiances 1996 Published under the "Elseworlds" logo. Batman: Scar of the Bat 1996 Published under the "Elseworlds" logo. Batman & Superman Adventures: World's Finest February 1997 Official comic book adaptation of the three-part episode "World's Finest" from Superman: The Animated Series. Batman and Robin: The Official Comic Adaptation of the Warner Bros. Motion Picture June 1997 Published in conjunction with the film Batman & Robin. Published under the "Elseworlds" logo. The Batman and Robin Adventures: SubZero Published in conjunction with the animated film Batman & Mr. Freeze: SubZero. Batman: Batgirl volume 2 1998 Published under the Girlfrenzy! trade dress. Elseworld's Finest: Supergirl & Batgirl September 1998 Published under the "Elseworlds" logo. Batman: Two Faces #1 November 1998 Published under the "Elseworlds" logo. Birds of Prey: The Ravens 1998 Published under the Girlfrenzy! trade dress. Batman: I, Joker 1998 Published under the "Elseworlds" logo. Batgirl and Batman: Thrillkiller '62 Published under the "Elseworlds" logo. Batman: Nosferatu 1999 Published under the "Elseworlds" logo. Batman/Lobo April 2000 Published under the "Elseworlds" logo. The Batman of Arkham June 2000 Published under the "Elseworlds" logo. Batman: Dreamland July 2000 The sequel to Batman: The Abduction. Batman/Demon: A Tragedy 2000 Published under the "Elseworlds" logo. Batman Beyond: Return of the Joker February 2001 Published in conjunction with the animated film Batman Beyond: Return of the Joker. Batman: Our Worlds At War #1 August 2001 Published as part of the Our Worlds at War crossover event. Nightwing: Our Worlds At War #1 September 2001 Published as part of the Our Worlds at War crossover event. Harley Quinn: Our Worlds At War #1 October 2001 Published as part of the Our Worlds at War crossover event. Batman: Gotham Noir 2001 Published under the "Elseworlds" logo. Joker: Last Laugh Secret Files and Origins #1 December 2001 Published as part of the Joker: Last Laugh crossover event. Batman: The Golden Streets of Gotham 2003 Published under the "Elseworlds" logo. Batman: The Order of Beasts September 2004 Published under the "Elseworlds" logo. Catwoman: The Movie #1 2004 Published in conjunction with the film Catwoman. Batman Begins: The Official Movie Adaptation June 2005 Published in conjunction with the film Batman Begins. Batman: Battle for the Cowl - Gotham Gazette: Batman Dead? #1 May 2009 Published under the "Battle for the Cowl" trade dress. Batman: Battle for the Cowl - Commissioner Gordon #1 Published under the "Battle for the Cowl" trade dress. Batman: Battle for the Cowl - Arkham Asylum #1 June 2009 Published under the "Battle for the Cowl" trade dress. Batman: Battle for the Cowl - Man-Bat #1 Published under the "Battle for the Cowl" trade dress. Batman: Battle for the Cowl - The Underground #1 Published under the "Battle for the Cowl" trade dress. Batman: Battle for the Cowl - The Network #1 July 2009 Published under the "Battle for the Cowl" trade dress. Batman: Battle for the Cowl - Gotham Gazette: Batman Alive? #1 Published under the "Battle for the Cowl" trade dress. Batman: Arkham Asylum-The Road to Arkham Based on the Batman: Arkham Asylum video game. Batman/Doc Savage Special #1 January 2010 Published with the First Wave trade dress. Batman Incorporated: Leviathan Strikes #1 February 2012 Originally intended to be Batman Incorporated #9-10. Batman Versus Predator #1 – 3 February 1992 Dark Horse Comics Published in two formats. Batman/Grendel: Devil's Riddle #1 January 1993 Comico Comics First of two issues. Grendel/Batman: Devil's Masque #2 Second of two issues. Bruce Wayne: Agent of S.H.I.E.L.D. #1 April 1996 Published under the "Amalgam Comics" imprint. Legends of the Dark Claw #1 Published under the "Amalgam Comics" imprint. Batman/Grendel: Devil's Bones #1 June 1996 Dark Horse Comics First of two issues. Grendel/Batman: Devil's Dance #2 July 1996 Second of two issues. Dark Claw Adventures #1 June 1997 Marvel Comics Published under the "Amalgam Comics" imprint. Batman Versus Predator III: Blood Ties #1 – 4 Dark Horse Comics Published bi-weekly. Numerous miniseries have been reprinted under the same title as collections. This section lists only reprints from ongoing series. All were issued in trade paperback format unless noted otherwise. All DC Archive Editions are hardcover only and printed on high quality archival paper. The Batman Chronicles series plans to reprint every Batman adventure in color, in chronological order, in affordable trade paperbacks. It is not to be confused with the now-finished series of the same name. All Showcase Presents collections are large (over 500 pages), softcover, black-and-white-only reprints. The following trade paperbacks are stories that run through the "contemporary" books of the Batman Family. The earliest trade paperback, chronologically speaking, is Frank Miller's "Batman: Year One" storyline, which rebirthed the character in the Modern Age, re-telling the first year of his existence and how he came to be. These stories are from comic books still being published and are, in a sense, ongoing. They are listed here in the chronology of the storylines, rather than the publication dates of either the original comics or collections. In 2011, DC Comics rebooted their entire continuity. This relaunched continuity that ran from 2011 until 2016 is known as The New 52. The Batman family of books have also been rebooted. While the history and elements of this new continuity are very similar to the previous one, there are still fundamental differences between them. As such, the following collected works should be treated as a separate canonical entity. The collected works are listed in order of publication date, not in chronological order. This list includes all New 52 titles centered around Batman. This table is for updated versions of the various New 52 titles. Titles presented here may be updated to a more concise trade or expand previous trades. In 2016, DC Comics once again relaunched its continuity and entire line of ongoing monthly superhero comic books. Using the end of The New 52 initiative in May 2016 as its launching point, DC Rebirth is intended to restore the DC Universe to a form much like that prior to the "Flashpoint" storyline while still incorporating numerous elements of The New 52, including its continuity. The collected works are listed in order of publication date, not in chronological order. This list includes all DC Rebirth titles centered around Batman. The Dark Nights: Metal event is included here due to its Batman-centric focus. This table is for updated versions of the various DC Rebirth titles. Titles presented here may be updated to a more concise trade or expand previous trades. The following are collected works of the Batman: Legends of the Dark Knight comic book series, which primarily concentrates on early tales of Batman that are not necessarily considered canon, but have also been used during major crossover storylines (such as "Knightfall" and "No Man's Land"). The series has not yet been completely collected. This series has been collected in the following trade paperbacks. This section includes crossover comics between Batman and other characters. These trade paperbacks are collections of stories from varying Batman continuity, with a loose connection of hero, villain, or location. Decade editions reprint the "best" stories of the decade in trade paperbacks. ^ "Detective Comics". Comics.org. Retrieved 2011-06-19. ^ "Batman". Comics.org. Retrieved 2011-06-19. ^ "World's Best Comics". Comics.org. Retrieved 2011-06-19. ^ "World's Finest Comics". Comics.org. Retrieved 2011-06-19. ^ "Star Spangled Comics". Comics.org. Retrieved 2011-06-19. ^ "Brave and the Bold, The". Comics.org. Retrieved 2011-06-19. ^ "Joker, The". Comics.org. Retrieved 2011-06-19. ^ "Batman Family". Comics.org. Retrieved 2011-06-19. ^ "Man-Bat". Comics.org. Retrieved 2011-06-30. ^ "Batman and the Outsiders". Comics.org. Retrieved 2011-06-19. ^ "Outsiders, The". Comics.org. Retrieved 2011-06-19. ^ "Adventures of the Outsiders, The". Comics.org. Retrieved 2011-06-19. ^ "Huntress, The". Comics.org. Retrieved 2011-06-30. ^ "Legends of the Dark Knight". Comics.org. Retrieved 2011-06-19. ^ "Batman: Shadow of the Bat". Comics.org. Retrieved 2011-06-19. ^ "Batman: Legends of the Dark Knight". Comics.org. Retrieved 2011-06-19. ^ "Batman Adventures, The". Comics.org. Retrieved 2011-06-19. ^ "Catwoman". Comics.org. Retrieved 2011-06-29. ^ "Outsiders". Comics.org. Retrieved 2011-06-19. ^ "Robin". Comics.org. Retrieved 2011-06-19. ^ "Azrael". Comics.org. Retrieved 2011-06-28. ^ "Batman Chronicles, The". Comics.org. Retrieved 2011-06-27. ^ "Batman and Robin Adventures, The". Comics.org. Retrieved 2011-06-19. ^ "Nightwing". Comics.org. Retrieved 2011-06-30. ^ "Robin Plus". Comics.org. Retrieved 2011-06-19. ^ "Batman: Gotham Adventures". Comics.org. Retrieved 2011-06-27. ^ "Batman 80-Page Giant". Comics.org. Retrieved 2011-06-27. ^ "Azrael: Agent of the Bat". Comics.org. Retrieved 2011-06-28. ^ "Birds of Prey". Comics.org. Retrieved 2011-06-28. ^ "Anarky". Comics.org. Retrieved 2011-06-28. ^ "Batman Beyond". Comics.org. Retrieved 2011-06-27. ^ "Batman: Gotham Knights". Comics.org. Retrieved 2011-06-27. ^ "Batgirl". Comics.org. Retrieved 2011-06-28. ^ "Harley Quinn". Comics.org. Retrieved 2011-06-30. ^ "Gotham Central". Comics.org. Retrieved 2011-06-29. ^ "Batman Adventures". Comics.org. Retrieved 2011-06-27. ^ "Superman / Batman". Comics.org. Retrieved 2011-06-27. ^ "Batman Strikes, The". Comics.org. Retrieved 2011-06-27. ^ "Batman Confidential". Comics.org. Retrieved 2011-06-28. ^ Hyde, David (February 11, 2011). "Batman Solicits for May". The Source. DC Comics.com. Retrieved 2011-03-16. ^ "DCU | Comics". Dccomics.com. 2010-04-21. Archived from the original on 2011-07-06. Retrieved 2011-06-18. ^ "Batman: The Brave and the Bold". Comics.org. Retrieved 2011-06-19. ^ "Batman: Streets of Gotham". Comics.org. Retrieved 2011-06-28. ^ "Batman and Robin". Comics.org. Retrieved 2011-06-19. ^ "Gotham City Sirens". Comics.org. Retrieved 2011-06-29. ^ "Red Robin". Comics.org. Retrieved 2011-06-19. ^ "Batman: The Dark Knight". Comics.org. Retrieved 2011-06-28. ^ "Batman, Inc". Comics.org. Retrieved 2011-06-28. ^ "All New Batman: The Brave and the Bold, The". Comics.org. Retrieved 2011-06-19. ^ "Batman Beyond". Comics.org. Retrieved 2011-06-28. ^ "Batgirl". Comics.org. Retrieved 2011-12-08. ^ "Batman". Comics.org. Retrieved 2011-12-08. ^ "Batman: The Dark Knight". Comics.org. Retrieved 2011-12-08. ^ "Batman and Robin". Comics.org. Retrieved 2011-12-08. ^ "Batwing". Comics.org. Retrieved 2011-12-08. ^ "Bords of Prey". Comics.org. Retrieved 2011-12-08. ^ "Catwoman". Comics.org. Retrieved 2011-12-08. ^ "Detective Comics". Comics.org. Retrieved 2011-12-08. ^ "Nightwing". Comics.org. Retrieved 2011-12-08. ^ "Red Hood and the Outlaws". Comics.org. Retrieved 2011-12-29. ^ "Batman: Arkham Unhinged". Comics.org. Retrieved 2013-07-18. ^ "Batman: Li'l Gotham". Comics.org. ^ "Batman '66". Comics.org. Retrieved 2013-07-18. ^ "Batman Beyond". Comics.org. Retrieved 2018-04-15. ^ "Batman". Comics.org. Retrieved 2018-04-15. ^ "Batman Annual". Comics.org. Retrieved 2011-06-19. ^ "Batman Annual". Comics.org. Retrieved 2011-06-28. ^ "Batman and the Outsiders Annual". Comics.org. Retrieved 2011-06-19. ^ "Outsiders Annual, The". Comics.org. Retrieved 2011-06-19. ^ "Detective Comics Annual". Comics.org. Retrieved 2011-06-19. ^ "Legends of the Dark Knight Annual". Comics.org. Retrieved 2011-06-19. ^ "Robin Annual". Comics.org. Retrieved 2011-06-19. ^ "Batman: Legends of the Dark Knight Annual". Comics.org. Retrieved 2011-06-19. ^ "Batman: Shadow of the Bat Annual". Comics.org. Retrieved 2011-06-19. ^ "Batman Adventures Annual, The". Comics.org. Retrieved 2011-06-19. ^ "Catwoman Annual". Comics.org. Retrieved 2011-06-29. ^ "Azrael Annual". Comics.org. Retrieved 2011-06-28. ^ "Batman and Robin Adventures Annual, The". Comics.org. Retrieved 2011-06-19. ^ "Nightwing Annual". Comics.org. Retrieved 2011-06-30. ^ "Batgirl Annual". Comics.org. Retrieved 2011-06-28. ^ "Superman / Batman Annual". Comics.org. Retrieved 2011-06-28. ^ "Outsiders Annual". Comics.org. Retrieved 2011-06-19. ^ "Batman Annual". Comics.org. Retrieved 2012-07-10. ^ "Untold Legend of the Batman, The". Comics.org. Retrieved 2011-06-19. ^ "Shadow of the Batman". Comics.org. Retrieved 2011-06-19. ^ "Batman: The Dark Knight". Comics.org. Retrieved 2011-06-19. ^ "Batman: The Cult". Comics.org. Retrieved 2011-06-19. ^ "World's Finest". Comics.org. Retrieved 2011-06-19. ^ "Robin II". Comics.org. Retrieved 2011-06-19. ^ "Batman: Run, Riddler, Run". Comics.org. Retrieved 2011-06-19. ^ "Gotham Nights". Comics.org. Retrieved 2011-06-29. ^ "Batman: Sword of Azrael". Comics.org. Retrieved 2011-06-19. ^ "Robin 3000". Comics.org. Retrieved 2011-06-19. ^ "Robin III: Cry of the Huntress". Comics.org. Retrieved 2011-06-19. ^ "Batman: Two-Face Strikes Twice!". Comics.org. Retrieved 2011-06-19. ^ "Legends of the World's Finest". Comics.org. Retrieved 2011-06-19. ^ "Huntress". Comics.org. Retrieved 2011-06-30. ^ "Batman: Gotham Nights II". Comics.org. Retrieved 2011-06-27. ^ "Batman: Legends of the Dark Knight: Jazz". Comics.org. Retrieved 2011-06-19. ^ "Batman: Manbat". Comics.org. Retrieved 2011-06-27. ^ "Batman: The Ultimate Evil". Comics.org. Retrieved 2011-06-27. ^ "Batman Black and White". Comics.org. Retrieved 2011-06-27. ^ "Batman: GCPD". Comics.org. Retrieved 2011-06-27. ^ "Birds of Prey: Manhunt". Comics.org. Retrieved 2011-06-28. ^ "Batman: Gordon's Law". Comics.org. Retrieved 2011-06-27. ^ "Batman: The Long Halloween". Comics.org. Retrieved 2011-06-27. ^ "Superboy / Robin: World's Finest Three". Comics.org. Retrieved 2011-06-19. ^ "Thrillkiller". Comics.org. Retrieved 2011-06-30. ^ "Batman/Wildcat". Comics.org. Retrieved 2011-06-27. ^ "Elseworld's Finest". Comics.org. Retrieved 2011-06-19. ^ "Batman Adventures: The Lost Years, The". Comics.org. Retrieved 2011-06-27. ^ "Batman: Bane of the Demon". Comics.org. Retrieved 2011-06-27. ^ "Nightwing / Huntress". Comics.org. Retrieved 2011-06-30. ^ "Batman: Gordon of Gotham". Comics.org. Retrieved 2011-06-27. ^ "Catwoman / Wildcat". Comics.org. Retrieved 2011-06-29. ^ "Batman: Toyman". Comics.org. Retrieved 2011-06-27. ^ "Batman: Dark Knight of the Round Table". Comics.org. Retrieved 2011-06-27. ^ "Superman & Batman Generations". Comics.org. Retrieved 2011-06-27. ^ "Batman: No Man's Land". Comics.org. Retrieved 2011-06-27. ^ "Batman and Superman: World's Finest". Comics.org. Retrieved 2011-06-19. ^ "Batman: Book of the Dead". Comics.org. Retrieved 2011-06-27. ^ "Catwoman: Guardian of Gotham". Comics.org. Retrieved 2011-06-29. ^ "Batman: Dark Victory". Comics.org. Retrieved 2011-06-27. ^ "Batman: Haunted Gotham". Comics.org. Retrieved 2011-06-27. ^ "Batman: Joker Time". Comics.org. Retrieved 2011-06-19. ^ "Batman / Huntress: Cry For Blood". Comics.org. Retrieved 2011-06-27. ^ "Batman: Outlaws". Comics.org. Retrieved 2011-06-27. ^ "Robin: Year One". Comics.org. Retrieved 2011-06-19. ^ "Batman: The Doom That Came To Gotham". Comics.org. Retrieved 2011-06-27. ^ "Batman: Turning Points". Comics.org. Retrieved 2011-06-27. ^ "Batman: Hollywood Knight". Comics.org. Retrieved 2011-06-27. ^ "Batman: League of Batmen". Comics.org. Retrieved 2011-06-27. ^ "Superman & Batman: Generations II". Comics.org. Retrieved 2011-06-27. ^ "Batman: Orpheus Rising". Comics.org. Retrieved 2011-06-27. ^ "Batman: The Ankh". Comics.org. Retrieved 2011-06-27. ^ "Dark Knight Strikes Again, The". Comics.org. Retrieved 2011-06-29. ^ "Joker: Last Laugh". Comics.org. Retrieved 2011-06-19. ^ "Batman / Deathblow: After the Fire". Comics.org. Retrieved 2011-06-27. ^ "Gotham Girls". Comics.org. Retrieved 2011-06-29. ^ "Batman: Family". Comics.org. Retrieved 2011-06-27. ^ "Batgirl Year One". Comics.org. Retrieved 2011-06-28. ^ "Superman & Batman: Generations III". Comics.org. Retrieved 2011-06-27. ^ "Batman: Nevermore". Comics.org. Retrieved 2011-06-27. ^ "Arkham Asylum: Living Hell". Comics.org. Retrieved 2011-06-28. ^ "Arkham Asylum: Living Hell". batmanblackandwhite.com. Retrieved 2012-05-03. ^ "Batman / Superman / Wonder Woman: Trinity". Comics.org. Retrieved 2011-06-27. ^ "Batman: Death and the Maidens". Comics.org. Retrieved 2011-06-27. ^ "Batman: Tenses". Comics.org. Retrieved 2011-06-27. ^ "Batman: City of Light". Comics.org. Retrieved 2011-06-27. ^ "Batman: Harley & Ivy". Comics.org. Retrieved 2011-06-27. ^ "Batman / Catwoman: Trail of the Gun". Comics.org. Retrieved 2011-06-27. ^ "Catwoman: When in Rome". Comics.org. Retrieved 2011-06-29. ^ "Batman: Jekyll & Hyde". Comics.org. Retrieved 2011-06-28. ^ "Year One: Batman/Ra's al Ghul". Comics.org. Retrieved 2011-06-28. ^ "Batman: Dark Detective". Comics.org. Retrieved 2011-06-28. ^ "Year One: Batman/Scarecrow". Comics.org. Retrieved 2011-06-28. ^ "All Star Batman & Robin, The Boy Wonder". Comics.org. Retrieved 2011-06-19. ^ "Batman: Journey Into Knight". Comics.org. Retrieved 2011-06-28. ^ "Batman: Gotham County Line". Comics.org. Retrieved 2011-06-28. ^ "Batman: The Monster Men". Comics.org. Retrieved 2011-06-28. ^ "Batman: Secrets". Comics.org. Retrieved 2011-06-28. ^ "Batman: The Mad Monk". Comics.org. Retrieved 2011-06-28. ^ "Batman: Year 100". Comics.org. Retrieved 2011-06-28. ^ "Batman / Lobo: Deadly Serious". Comics.org. Retrieved 2011-06-28. ^ "Gotham Underground". Comics.org. Retrieved 2011-06-29. ^ "Batman: Death Mask". Comics.org. Retrieved 2011-06-28. ^ "Batman: Gotham After Midnight". Comics.org. Retrieved 2011-06-28. ^ "Huntress: Year One". Comics.org. Retrieved 2011-06-30. ^ "Superman and Batman vs. Vampires and Werewolves". Comics.org. Archived from the original on 2010-06-30. Retrieved 2011-06-28. ^ "Batman Cacophony". Comics.org. Retrieved 2011-06-28. ^ "Batman: Battle for the Cowl". Comics.org. Retrieved 2011-06-28. ^ "Azrael: Death's Dark Knight". Comics.org. Retrieved 2011-06-28. ^ "Oracle: The Cure". Comics.org. Retrieved 2011-06-30. ^ "Batman: The Widening Gyre". Comics.org. Archived from the original on 2011-06-29. Retrieved 2011-06-28. ^ "Blackest Night: Batman". Comics.org. Retrieved 2011-06-28. ^ "Arkham Reborn". Comics.org. Retrieved 2011-06-28. ^ "Batman: Unseen". Comics.org. Retrieved 2011-06-28. ^ "Batman: The Return of Bruce Wayne". Comics.org. Retrieved 2011-06-28. ^ "Red Hood: The Lost Days". Comics.org. Retrieved 2012-12-29. ^ "Batman: Odyssey". Comics.org. Archived from the original on 2012-01-02. Retrieved 2011-06-28. ^ "Batman: Orphans". Comics.org. Archived from the original on 2011-07-23. Retrieved 2011-06-28. ^ "Batman: Arkham City". Comics.org. Retrieved 2011-06-28. ^ "Batman: Gates of Gotham". Comics.org. Retrieved 2011-06-28. ^ "Flashpoint: Batman Knight of Vengeance". Comics.org. Retrieved 2011-06-28. ^ "Batman: Odyssey". Comics.org. Archived from the original on 2014-05-23. Retrieved 2011-12-08. ^ "Huntress". Comics.org. Retrieved 2011-12-08. ^ "Penguin: Pain & Prejudice". Comics.org. Archived from the original on 2014-05-23. Retrieved 2011-12-08. ^ "Batman: Black and White". Comics.org. ^ "3-D Batman". Comics.org. Archived from the original on 2014-08-13. ^ "Batman Special". Comics.org. Archived from the original on 2011-01-28. Retrieved 2011-06-19. ^ "Batman: Son of the Demon". Comics.org. Archived from the original on 2010-12-19. Retrieved 2011-06-19. ^ "Batman: Son of the Demon". Comics.org. Retrieved 2011-06-26. ^ "Outsiders Special, The". Comics.org. Archived from the original on 2012-10-16. Retrieved 2011-06-19. ^ "Batgirl Special". Comics.org. Retrieved 2011-06-19. ^ "Batman: The Killing Joke". Comics.org. Archived from the original on 2011-11-06. Retrieved 2011-06-19. ^ "Batman: The Killing Joke Special Edition". Comics.org. Retrieved 2011-06-20. ^ "Gotham by Gaslight: An Alternative History of the Batman". Comics.org. Retrieved 2011-06-29. ^ "Arkham Asylum". Comics.org. Retrieved 2011-06-28. ^ "Batman: The Official Comic Adaptation of the Warner Bros. Motion Picture". Comics.org. Retrieved 2011-06-19. ^ "Batman: Bride of the Demon". Comics.org. Retrieved 2011-06-19. ^ "Batman: Bride of the Demon". Comics.org. Retrieved 2011-06-26. ^ "Batman: Digital Justice". Comics.org. Retrieved 2011-06-19. ^ "Batman: Full Circle". Comics.org. Retrieved 2011-06-27. ^ "Batman: Holy Terror". Comics.org. Retrieved 2011-06-19. ^ "Batman: Master of the Future". Comics.org. Retrieved 2011-06-19. ^ "Batman & Dracula: Red Rain". Comics.org. Retrieved 2011-06-19. ^ "Batman: Seduction of the Gun". Comics.org. Retrieved 2011-06-19. ^ "Batman: Penguin Triumphant". Comics.org. Retrieved 2011-06-19. ^ "Batman: Catwoman Defiant". Comics.org. Retrieved 2011-06-19. ^ "Batman: Night Cries". Comics.org. Retrieved 2011-06-19. ^ "Batman: Night Cries". Comics.org. Retrieved 2011-06-26. ^ "Batman: Birth of the Demon". Comics.org. Retrieved 2011-06-19. ^ "Batman: Birth of the Demon". Comics.org. Retrieved 2011-06-26. ^ "Batman: A Word to the Wise". Comics.org. ^ "Batman: The Blue, the Grey, and the Bat". Comics.org. Retrieved 2011-06-19. ^ "Batman / Green Arrow: The Poison Tomorrow". Comics.org. Retrieved 2011-06-19. ^ "Batman Returns: The Official Comic Adaptation of the Warner Bros. Motion Picture". Comics.org. Retrieved 2011-06-19. ^ "Batman: Vengeance of Bane Special". Comics.org. Retrieved 2011-06-19. ^ "Batman: Dark Joker – The Wild". Comics.org. Archived from the original on 2010-04-11. Retrieved 2011-06-19. ^ "Batman: Legends of the Dark Knight Halloween Special". Comics.org. Archived from the original on 2010-11-30. Retrieved 2011-06-19. ^ "Batman: Mask of the Phantasm". Comics.org. Archived from the original on 2012-10-16. Retrieved 2011-06-19. ^ "Batman / Houdini: The Devil's Workshop". Comics.org. Retrieved 2011-06-19. ^ "Batman Adventures: Mad Love, The". Comics.org. Archived from the original on 2010-09-04. Retrieved 2011-06-19. ^ "Batman: Bloodstorm". Comics.org. Archived from the original on 2011-01-20. Retrieved 2011-06-20. ^ "Batman: Castle of the Bat". Comics.org. Retrieved 2011-06-20. ^ "Batman: In Darkest Knight". Comics.org. Retrieved 2011-06-20. ^ "Batman: The Last Angel". Comics.org. Retrieved 2011-06-20. ^ "Batman: Madness-A Legends Of The Dark Knight Halloween Special". Comics.org. Retrieved 2011-06-19. ^ "Batman Adventures Holiday Special, The". Comics.org. Retrieved 2011-06-20. ^ "Batman Forever: The Official Comic Adaptation of the Warner Bros. Motion Picture". Comics.org. Retrieved 2011-06-27. ^ "Nightwing: Alfred's Return". Comics.org. Retrieved 2011-06-30. ^ "Underworld Unleashed: Batman Devil's Asylum". Comics.org. Archived from the original on 2012-10-17. Retrieved 2011-06-27. ^ "Batman: Brotherhood of the Bat". Comics.org. Archived from the original on 2011-11-17. Retrieved 2011-06-27. ^ "Batman: Ghosts – A Legends of the Dark Knight Halloween Special". Comics.org. Retrieved 2011-06-19. ^ "Batman: Mitefall". Comics.org. Retrieved 2011-06-27. ^ "Batman: The Vengeance of Bane II". Comics.org. Retrieved 2011-06-27. ^ "Batman: Riddler – The Riddle Factory". Comics.org. Retrieved 2011-06-27. ^ "Batman: Two-Face – Crime and Punishment". Comics.org. Retrieved 2011-06-27. ^ "Azrael Plus". Comics.org. Retrieved 2011-06-28. ^ "Batman: Dark Allegiances". Comics.org. Retrieved 2011-06-27. ^ "Batman: Death of Innocents". Comics.org. Retrieved 2011-06-27. ^ "Batman: Scar of the Bat". Comics.org. Retrieved 2011-06-27. ^ "Batman / Deadman: Death and Glory". Comics.org. Retrieved 2011-06-27. ^ "Batman / Demon". Comics.org. Retrieved 2011-06-27. ^ "Black Canary/Oracle: Birds of Prey". Comics.org. Retrieved 2011-06-28. ^ "Joker: Devil's Advocate". Comics.org. Retrieved 2011-06-19. ^ "The Joker: Devil's Advocate". Comic Book DB. Retrieved 2011-06-26. ^ "Batman: Blackgate". Comics.org. Retrieved 2011-06-27. ^ "Batman & Superman Adventures: World's Finest". Comics.org. Retrieved 2011-06-19. ^ "Batman Plus". Comics.org. Retrieved 2011-06-27. ^ "Batman: Bane". Comics.org. Retrieved 2011-06-27. ^ "Batman: Batgirl". Comics.org. Archived from the original on 2010-09-01. Retrieved 2011-06-27. ^ "Batman: Mr. Freeze". Comics.org. Retrieved 2011-06-27. ^ "Batman: Poison Ivy". Comics.org. Retrieved 2011-06-27. ^ "Batman and Robin: The Official Comic Adaptation of the Warner Bros. Motion Picture". Comics.org. Retrieved 2011-06-19. ^ "Batman Chronicles: The Gauntlet". Comics.org. Retrieved 2011-06-27. ^ "Batman Secret Files". Comics.org. Retrieved 2011-06-27. ^ "Batman: Dark Knight Dynasty". Comics.org. Retrieved 2011-06-27. ^ "Catwoman Plus". Comics.org. Retrieved 2011-06-29. ^ "Batman: Masque". Comics.org. Retrieved 2011-06-27. ^ "Batman / Phantom Stranger". Comics.org. Retrieved 2011-06-27. ^ "Batman And Robin Adventures: Sub-Zero, The". Comics.org. Retrieved 2011-06-19. ^ "Birds of Prey: Revolution". Comics.org. Retrieved 2011-06-28. ^ "Birds of Prey: Wolves". Comics.org. Retrieved 2011-06-28. ^ "Batgirl Adventures, The". Comics.org. Retrieved 2011-06-28. ^ "Batman: The Abduction". Comics.org. Retrieved 2011-06-27. ^ "Batman: Blackgate Isle of Men". Comics.org. Retrieved 2011-06-27. ^ "Batman: Arkham Asylum–Tales of Madness". Comics.org. Retrieved 2011-06-27. ^ "Batman / Spoiler / Huntress – Blunt Trauma". Comics.org. Retrieved 2011-06-27. ^ "Batman: Batgirl". Comics.org. Retrieved 2011-06-27. ^ "Elseworld's Finest: Supergirl & Batgirl". Comics.org. Retrieved 2011-06-19. ^ "Batman Villains Secret Files". Comics.org. Retrieved 2011-06-27. ^ "Batman: Two Faces". Comics.org. Retrieved 2011-06-27. ^ "Birds of Prey: Batgirl". Comics.org. Retrieved 2011-06-28. ^ "Birds of Prey: The Ravens". Comics.org. Archived from the original on 2011-01-09. Retrieved 2011-06-28. ^ "Batman: Crimson Mist". Comics.org. Archived from the original on 2011-09-21. Retrieved 2011-06-27. ^ "Batman: Crimson Mist". Comics.org. Retrieved 2011-06-27. ^ "Batman: I, Joker". Comics.org. Retrieved 2011-06-19. ^ "Batman: Reign of Terror". Comics.org. Retrieved 2011-06-27. ^ "Batman: Scottish Connection". Comics.org. Archived from the original on 2011-02-28. Retrieved 2011-06-27. ^ "Batman / Scarecrow 3-D". Comics.org. Retrieved 2011-06-27. ^ "Robin / Argent Double-Shot". Comics.org. Retrieved 2011-06-19. ^ "Thrillkiller '62". Comics.org. Retrieved 2011-06-30. ^ "Batman: Nosferatu". Comics.org. Retrieved 2011-06-27. ^ "Batman: Joker's Apprentice". Comics.org. Retrieved 2011-06-19. ^ "Book of Shadows, The". Comics.org. Retrieved 2011-06-27. ^ "Batman: Bullock's Law". Comics.org. Retrieved 2011-06-27. ^ "Batman: Fortunate Son". Comics.org. Retrieved 2011-06-27. ^ "Batman: Fortunate Son". Comic Book DB. Retrieved 2011-06-27. ^ "Batman: Harley Quinn". Comics.org. Retrieved 2011-06-27. ^ "Nightwing Secret Files". Comics.org. Retrieved 2011-06-30. ^ "Batman: Day of Judgment". Comics.org. Retrieved 2011-06-27. ^ "Batman: War on Crime". Comics.org. Retrieved 2011-06-27. ^ "Batman: The Chalice". Comics.org. Retrieved 2011-06-27. ^ "Batman: DOA". Comics.org. Retrieved 2011-06-27. ^ "Batman: No Law And A New Order". Comics.org. Retrieved 2011-06-27. ^ "Batman: No Man's Land Secret Files". Comics.org. Retrieved 2011-06-27. ^ "Batman: Gotham City Secret Files". Comics.org. Retrieved 2011-06-27. ^ "Batman / Lobo". Comics.org. Retrieved 2011-06-27. ^ "Batman: The Hill". Comics.org. Retrieved 2011-06-27. ^ "Sins of Youth: Batboy and Robin". Comics.org. Retrieved 2011-06-19. ^ "Batman of Arkham, The". Comics.org. Retrieved 2011-06-27. ^ "Batman: Dreamland". Comics.org. Retrieved 2011-06-27. ^ "Batman: Ego". Comics.org. Retrieved 2011-06-27. ^ "Robin 80-Page Giant". Comics.org. Retrieved 2011-06-19. ^ "Batman: Harvest Breed". Comics.org. Retrieved 2011-06-27. ^ "Superman and Batman: World's Funnest". Comics.org. Retrieved 2011-06-27. ^ "Batman / Demon: A Tragedy". Comics.org. Retrieved 2011-06-27. ^ "Nightwing 80-Page Giant". Comics.org. Retrieved 2011-06-30. ^ "Realworlds: Batman". Comics.org. Retrieved 2011-06-27. ^ "Batman Beyond: Return of the Joker". Comics.org. Retrieved 2011-06-19. ^ "Nightwing: The Target". Comics.org. Retrieved 2011-06-30. ^ "Batman: Our Worlds At War". Comics.org. Retrieved 2011-06-27. ^ "Nightwing: Our Worlds At War". Comics.org. Retrieved 2011-06-30. ^ "Harley Quinn: Our Worlds At War". Comics.org. Retrieved 2011-06-30. ^ "Batman: Gotham Noir". Comics.org. Retrieved 2011-06-27. ^ "Batman / Scarface: A Psychodrama". Comics.org. Retrieved 2011-06-27. ^ "Joker: Last Laugh Secret Files". Comics.org. Retrieved 2011-06-19. ^ "Batman: The 10-Cent Adventure". Comics.org. Retrieved 2011-06-27. ^ "Batman: Nine Lives". Comics.org. Retrieved 2011-06-27. ^ "Batman: Nine Lives". Comic Book DB. Retrieved 2011-06-27. ^ "Batgirl Secret Files and Origins". Comics.org. Retrieved 2011-06-28. ^ "Catwoman: Selina's Big Score". Comics.org. Retrieved 2011-06-29. ^ "DC First: Batgirl/Joker". Comics.org. Retrieved 2011-06-19. ^ "Batman: Absolution". Comics.org. Retrieved 2011-06-27. ^ "Catwoman Secret Files and Origins". Comics.org. Retrieved 2011-06-29. ^ "Batman / Nightwing: Bloodborne". Comics.org. Retrieved 2011-06-27. ^ "Batman: Child of Dreams". Comics.org. Retrieved 2011-06-27. ^ "Batman: Hong Kong". Comics.org. Retrieved 2011-06-27. ^ "Birds of Prey Secret Files 2003". Comics.org. Retrieved 2011-06-28. ^ "Planetary / Batman: Night on Earth". Comics.org. Retrieved 2011-06-27. ^ "Superman / Batman Secret Files 2003". Comics.org. Archived from the original on 2011-08-05. Retrieved 2011-06-27. ^ "Batman: Golden Streets of Gotham". Comics.org. Retrieved 2011-06-27. ^ "Batman / Joker: Switch". Comics.org. Retrieved 2011-06-19. ^ "Birds of Prey: Batgirl / Catwoman". Comics.org. Retrieved 2011-06-28. ^ "Birds of Prey: Catwoman / Oracle". Comics.org. Archived from the original on 2011-01-09. Retrieved 2011-06-28. ^ "Teen Titans / Outsiders Secret Files 2003". Comics.org. Retrieved 2011-06-19. ^ "Batman: Room Full of Strangers". Comics.org. Retrieved 2011-06-27. ^ "Batman: The Order of Beasts". Comics.org. Retrieved 2011-06-28. ^ "Batman: The 12 Cent Adventure". Comics.org. Retrieved 2011-06-27. ^ "Catwoman: The Movie". Comics.org. Retrieved 2011-06-29. ^ "Batman: The Man Who Laughs". Comics.org. Archived from the original on 2012-10-17. Retrieved 2011-06-28. ^ "Batman: The Man Who Laughs". Comics.org. Retrieved 2011-06-28. ^ "Batman / Danger Girl". Comics.org. Retrieved 2011-06-28. Bat-Encyclopedia (in The time allocated for running scripts has expired. )The time allocated for running scripts has expired.